To minimize this risk, the well cover should be a tight-fitting concrete curb and cap with no cracks and should sit about a foot above the ground. Slope the ground away from the well so that surface water will not pond around the well. If there’s a pit above the well, either to hold the pump or to access the fitting, you may also be able to pour a grout sealant along the outside of the well pipe. 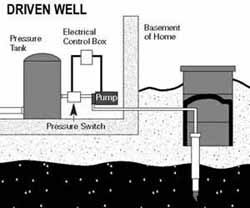 Protecting the water quality requires that you maintain proper well construction and monitor your activities around the well. 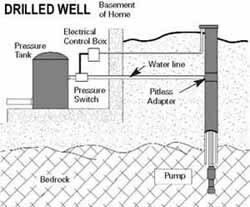 It is also important to follow the same land use precautions around the driven well as described under dug wells.